As the Tishman Speyer deal for the Hudson Yards collapsed completely on Tuesday, tempers have flared over the fate of development along the West Side. In one corner, we have Sen. Chuck Schumer fighting for Moynihan Station and office space in and around Penn Station. In the other corner, we have Mayor Mike Bloomberg, 18 months away from heading out of office and in search of a lasting New York City legacy. The stakes in this political death match are high: They start with the 7 train extension and end with nothing short of a radical alteration of the Manhattan landscape west of Midtown. How it will end is anyone’s guess, but with Tishman Speyer out and the MTA back in negotiations with other potential Yards suitors, the battle has just begun. The troubles started when talks between the MTA and Tishman Speyer collapsed late last week. While the Bloomberg administration put pressure on the two groups to keep trying this week and even promised to have the city cover the cost overruns for the 7 extension — but not necessarily that controversial station at 41st and 10th Ave. — things died for good today. The Metropolitan Transportation Authority’s push for a 16-million-square-foot project at Hudson Yards, strongly encouraged by the city, suffered a setback last week when talks with its chosen developer, Tishman Speyer, broke down. Although Mr. Schumer said, “I am enthusiastic about Hudson Yards,” he said no one would build office space there until the No. 7 extension is in place. Instead, he said, government should push for more office space by Penn Station, which has one-sixth as much as the Grand Central Terminal area despite serving more commuters. Schumer and I are on the same page in regards to the 7 line extension, but Schumer and the Mayor disagree over the role of the Port Authority. The Senior Senator from New York would have the Port Authority assume control of this plan. Bloomberg, meanwhile, will have none of it because the Port Authority can’t even seem to get its act together in Lower Manhattan. It’s a grand ol’ political war of words. On the MTA front, the agency will in all likelihood push hard to wrap up a deal with another suitor. They need the money for their capital budget, and Charles Bagli at City Room reported that Douglas Durst, Stephen Ross and Steven Roth, three other developers interested in the space, are now back on the table. While Durst would have once offered up just $39 million less than Tishman Speyer, that figure is sure to drop, leaving many to wonder why no one raised red flags with Tishman’s offer before it was accepted. The demands that eventually quashed the talks were not new. Photo of Moynihan Station via Moynihan Station on flickr. Well, this latest Hudson Yards development is not very good news for the MTA. Late this afternoon, negotiations between the MTA and Tishman Speyer over the development of the Rail Yards on Manhattan’s Far West Side reached an impasse. The cause of the impasse was Tishman Speyer’s attempt to change a central deal term in an effort to postpone the closing on the Eastern Yard until the Western Yard was satisfactorily re-zoned. This demand changed the economics of the proposed deals and the certainty of payments to the MTA. The MTA remains committed to developing these unique and very valuable parcels of land. For those who have been following progress on the negotiations, this collapse came just short of a month after the two sides missed a deadline for a conditional agreement. Now, while a Tishman Speyer deal remains a faint possibility, it’s back to the drawing board for an MTA facing the prospects of a significantly lower dollar amount for the rights to the Hudson Yards space. But if the authority reopened negotiations with another bidder, it would almost certainly mean that it would get less money for the rights to the property, real estate executives said. At the same time, the sudden setback in the development of the railyards is a very public embarrassment for everyone involved, including the developer, whose reputation may be at risk; the authority, which was counting on the money for its capital budget; and the Bloomberg administration, which had made the transformation of the once-industrial West Side a centerpiece of its two-term mayoralty. On one hand — the very obvious hand — this collapse is bad news for the MTA. They will lose out on another $10 million a year, and the fate of the Hudson Yards is once hazy. They’re in the middle of constructing a 7 line extension to, literally, nowhere without a stop in the one area that’s actually populated and needs a subway stop at 41st St. and 10th Ave. The Bloomberg Administration is bound to put pressure on both parties to work out a deal since part of Mayor Bloomberg’s legacy rests on it, but it won’t be that easy. On the other hand, some good could emerge from this impasse. First, the MTA should be pressure on the Bloomberg Administration to guarantee all funding for the 7 line extension. That should include any cost overruns and a fully functional station at 41st St. and 10th Ave. Building a shell now will only lead to higher costs in the future. Next — and this won’t happen — the MTA should consider whether or not the 7 line extension is worth it now if the land rights are up for grabs again. The MTA could use the money being spent on that extension on Second Ave. or even on routine maintenance. While I know the city is funding the part currently under construction, having a subway line go nowhere will help no one. Supposedly, the second time is the charm. Today, the MTA is going to find out if they procure that second time charm with the Hudson Yards area as they are set to issue a request for development proposals for the valuable land on the Far West Side. The High Line will prevent the development of 13,000 square feet of retail space, resulting in $20 million of lost revenue, according to the report. It will also compromise retail space, storage and parking spots and cost a developer $26 million in lower rents. The cost of tearing down the High Line and replacing it with a raised park would be $38 million. The MTA has said that it supports the presence of the High Line, but only if it does not drive down bids for the site by more than $25 million. Advocacy group Friends of the High Line has previously argued that the cost of maintaining the structure is under $1 million. As construction crews work day in and day out on the southern part of this eventual park in the sky, the days are numbered for the northern part. As much as I am looking forward to the High Line Park’s unveiling, the economics make me believe that tearing down the northern part is for the best. As I walked along 10th Ave. on Friday afternoon after work, my mind wandered to the future. 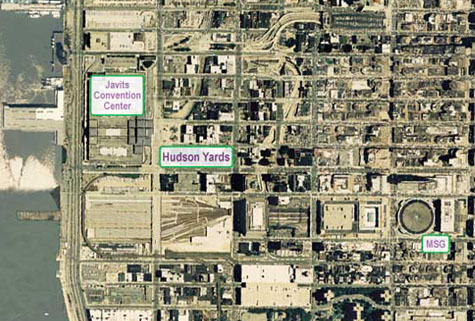 I crossed the Hudson Yards area and tried to envision the development that will soon arrive. I envisioned the extended 7 line feeding Manhattan’s last frontier. While Lincoln Tunnel traffic — hopefully alleviated by the congestion fee — may turn many off from this neighborhood, it needs development. The area from Chelsea to the mid-40s is a dead zone. If the cost of turning an empty pocket of Manhattan into a livable and usable area of the city is the dismantling of part of the High Line, then I shall simply bid this relic of another era good bye and appreciate the new park even more. 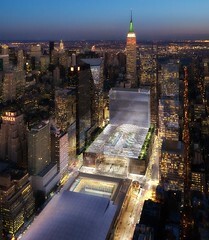 Remember the Hudson Yards redevelopment plans? Once upon a time, this midtown area of the Far West Side was the centerpiece of Mayor Bloomberg’s plans for residential and commercial growth in Manhattan. Those were the days. Now, the site barely registers on the Department of City Planning’s Website. With the ill-fated plans for the Jets Stadium long gone, the city has, thankfully, moved on to better and more useful projects. But the MTA, owners of highly valued land around the Hudson Yards site on the Far West Side, isn’t quite done yet. In fact, with the 7 line extension plans in the works, the city and the MTA are going to work together to sell some of this valuable land, and the asking price could be as high as $1.3 billion. According to a Reuters story, the Authority will begin to find developers for the 26-acre rail yard. As one of the largest — if not the biggest — tract of empty land in Manhattan, the MTA expects to receive a windfall sum for this land. The estimated $1.3 billion the MTA could fetch for this area will help fund the Second Ave. subway project, the 7 line extension and other various Capital Construction projects. “It’s certainly in the best interests of the city and state that we’re able to maximize our revenues,” an MTA spokesman said. In a few weeks, the MTA plans to hold public hearings on how the land should be used and will then issue design guidelines for developers. These hearings will focus on questions surrounding the availability of affordable housing and the mix of residential and commercial buildings. Notably, the MTA will hold onto the rail yards, and the developers will have to build a platform — for as much as $400 million — over the train storage and maintenance facility. These new plans are a marked departure from the 2005 shenanigans. At the time, the City, under Bloomberg, attempted to secure the land for a new Jets Stadium and an expanded Convention Center area. They offered the lowball sum of $300 million, and public forces mobilized to stop what would have been a damaging sale at the time. With the land appraised at a value of nearly $1 billion more than the City’s offer two years, the MTA looks to capitalize on what could have been a very costly mistake. On another note, the Friends of the High Line have to feel a little bit better about the fate of the norther section of the former freight line. “I think we would like to see it remain if that can happen without having a major impact on the revenue that the MTA gets from the site,” the MTA spokesman said. Good stuff.